Africa is in need the land of great and amazing diversity, attracting tourists from parts of the globe. Almost every country on the African continent has something so unique that travellers want to explore and experience it, even if it’s once in their lifetime. From Egypt’s Pyramids of Giza to Zambia’s Victoria Falls, Kenya’s Masai Mara seventh wonder of the new world and Cape Town spectacular scenery and beaches to mountain gorillas tracking in Virunga Range in Rwanda and Uganda; Africa is absolutely a holiday haven and truly a place to experience unforgettable wild adventures. Diversity is what makes safaris and African adventures captivating to international tourists. Whilst it’s not possible to take in everything Africa has to offer on one trip, many safari companies are now offering multi-destination/multi-country tours that allow you to take the best sights and experiences in from a whole region. Alternatively, you can pick a country for your safari that has lots on offer – such as Kenya, an East Africa holiday destination that offers the opportunity to sample almost all African thrills and experiences within her boundaries. So, what makes Kenya one of Africans preferred safari destinations? The wide variety of wildlife in the country is attributed to the fact that Kenya has many ecological zones. From the coastal region of Mombasa, semi-desert Northern Kenya, highlands and mountains in Central Kenya, breath-taking Rift Valley to savannah grassland in western Kenya. The legendary Big Five animals of Africa – Lion, elephant, buffalo, leopard and rhino – are all found in this country, sometimes in abundance. The number of other wild animals found in various national parks and reserves has to be seen to be believed. Nairobi National park is indeed a unique one as it’s the only wildlife park located within a country’s capital city in the whole world. The ideal location of this park enables guests on very tight schedule to quick safari and enjoy some of the wildlife including black rhino, lion, leopard, cheetah, hyena, buffaloes, Giraffe, zebra, wildebeest, eland and diverse birdlife with over 400 species. Other tourist attractions in the park include Nairobi Safari Walk and the walking trails at hippo pools. You really don’t have to leave Nairobi, Kenya’s capital to sample popular wildlife. Travellers on short stays in Nairobi city centre can just rush to the park in few minutes and experience the African wild adventure. The coastal city of Mombasa is one of Kenya’s most popular holiday destinations. The white sandy beaches and some of the finest beach resorts provide a paradise for tourists. This beautiful coastline is lined with palms making these Indian Ocean beaches a truly breath-taking scene. There’s wide variety of holiday accommodation for all types of travellers. Hotels in the coastal town of Mombasa are famous for their world class and luxury hospitality. By simply taking a trip to this coastal town, you will experience a real African beach adventure, without necessarily having to travel to multiple African countries. The Fort Jesus, Mombasa marine reserve and old Dhow harbour are some of the iconic attractions of this Swahili town. The unusual and spectacular migration of thousands of wildebeest and zebra from vast Masai Mara reserve to Serengeti is indeed a wonder. This once a year phenomenon has many tourists from all corners of the world going to Kenya every year. This experience cannot found anywhere else in Africa – it’s only in Kenya! Cheers for useful content in your write up Why Kenya Remains One Of Africa’s Preferred Safari Destinations! It was a good article, but until i read the endind…”This experience cannot found anywhere else in Africa – it’s only in Kenya!”. Now that is not correct unless you forgot Kenya’s neighbor country, Tanzania. 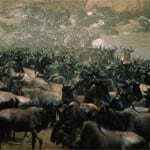 A New Wonder Of The World – The Masai Mara Wildebeest Migration:this happened between two country, Kenya and Tanzania. Mara in Kenya side and Serengeti in Tanzania side.The difference is these animals stay the longest period in Serengeti,8 or more months and migrate to Masai mara kenya only during dry season,so you know what will happens when in Serengeti experience longer rain like this year..the animal returns HOME early..two months early.If you want to compare sizes between these two national park,let says Masai Mara cant even beat half size of `serengeti http://www.masai-mara.net/masai_mara_great_migration.html. Diverse wildlife-what is in Kenya is in Tanzania, the difference is is more in Tanzania and Tanzania offer what is not in Kenya. Have you heard of Jane Goodall, the chimpanzee and Gombe, oh well that is Tanzania,but there are even more national parks. This is country that reserve more than twenty five percent of his country for national park and game reserves, google to find its national parks and you will understand Kenya can not compete with fifty percent of its national parks..yes. A National Park In The Capital City-Tanzania offer Arusha national park together with tarangire,lake manyara, Ngorongoro, Serengeti and Kilimanjaro national park. This is what Tanzania call northern circuit. Tanzania offer southern circuit which includes, Selous, Mikumi, Mahale, Ruaha, Kitulo and more in further north basically each part of the country. White Sand Beaches & Finest Resorts in Africa-apart from all east part to border indian oceac(like Kenya) everybody knows about Zanzibar. but Tanzania offer all that eastern shore with more islands and more world class lake of Victoria(small part is in Kenya too),Tanganyika and Lake Malawi/Nyasa..google that to know more. Kenya have great infrastructure in comparison to Tanzania that is true, but national parks,beach and animal variety, i would say if you do your reach right..just use google and compare, you will see Kenya hardly reach fifty percent of what Tanzania offer..i said fifty..go ahead google is free. 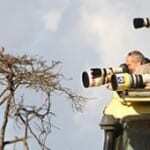 How To Take The Perfect Safari Photo Safari Season: When’s The Best Time For Safari?